The more I talk about the minor exam with folks in my program, the better I understand how it can lay important groundwork for the dissertation. Although the goal is to produce an annotated bib and publishable article by the end of the year (at the latest! ), it’s clear that these can feed at least two chapters of the diss. Needless to say, and as I mentioned last week, this is an exciting and terrifying time, knowing the weight of these choices for future work and scholarly identity. The rub at the moment has to do with considering the exigence of my work. Why exactly would this dissertation matter? Or perhaps, how could it matter? I have a rich, multimodal site worth pursuing, but the exigence and questions for that study are a bit hazy. One faculty member advised me to reflect upon what bothers me about the field and start there. When I do, I think about a few things. First, I think about the need to explore literacy and writing as an ongoing and complex process — as networked, multimodal, and difficult to predict. We have many theories and tools in place for these conceptions of literacy, but virtually no RAD writing studies of amateur writing cultures doing it. Moreover, like Jody Shipka, I’m bothered by the tendency in the field to equate “technology” with the digital. More explicitly, I wonder how “old media” and its meanings/uses get altered through a particular new media lens. How do codes and spatial templates, for example, constrict the possibilities of form? How do digital technologies assist — as well as limit — the circulation of writing? Again, zine communities, which embrace a variety of modes for production and distribution, provide an interesting space for learning the nuances of our writing tools. Second, I wonder if we overdetermine our pedagogies; that is, in pursuit of our own relevance/professionalism, we place too much emphasis on curriculum, assessment, and instruction. As a ex-writing center director and continuing consultant and teacher I’ve been more attracted to true studio models of writing, where teachers/consultants create or restrict the conditions for various attempts at writing, but do not micromanage the interactions. How might a more responsive, ongoing syllabi, where readings are curated by students and occasions for writing/heuristics are co-constructed (to give a few examples), open up some of the possibilities for learning? My sense is that zine makers — as self-organizing communities — have a lot to teach us about the autodidactic functions of literacy. Finally, for many years, when it comes to the way writing works more generally, I’ve been struck by ongoing tensions between structure and agency. That is, I wonder when or in what ways is writing the product of sociocultural forces and when is it the act of our own choosing. In what cases are those acts of our own choosing actually the product of structuring forces? Here I am drawn to the work of Marilyn Cooper, Deb Brandt, Berkenkotter and Huckin, and the theories of Pierre Bourdieu. Taken together, I imagine a diss that studies the various spaces and moments of zine-making — individual composers cutting and pasting in their rooms, writers and presses trading at zine fests, and interactions on online spaces like We Make Zines — to consider what a DIY praxis or self-sponsorship might teach us about multimodal composing and pedagogy. Two or the more compelling questions for me include: Why print and why now? What are the affordances of the medium in an era of Tumblr or Twitter? Secondly, how do self-sponsored zine-makers develop and learn multiple literacies? How can these be traced at the level of composition, production, and circulation? 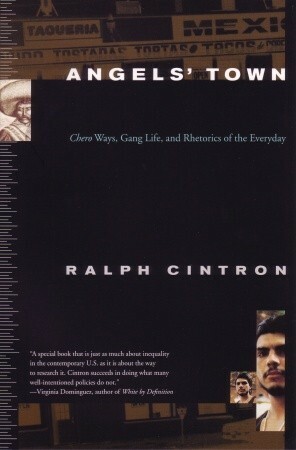 This week in my advanced methods course we read the first 4 chapters from Angels Town: Chero Ways, Gang Life, and the Rhetorics of Everyday (1998) by Ralph Cintron. Though I hadn’t heard of Cintron before this semester, I’ve been anticipating this book since the syllabus was distributed in January because (1) we’re breaking it up over two weeks of the semester and (2) other members of the program have lauded it in passing. Obviously the book carries some weight. So what is that weight? What’s striking right from the preface is Cintron’s reflexivity. Cintron combines critical ethnography with rhetorical theory to provide a thick portrait of a Latino/a neighborhood in Chicago and extends that portrait to a larger commentary on the relationship between representation, power and language in everyday life (note to self: read de Certeau). As he notes early in the preface, “one of the book’s controlling questions is How does one create respect under conditions of little or no respect?” (x). He admits the problem in answering this question, reducing the method of fieldwork to “the difficulty of finding the truth inside the lie, the lie inside the truth” (xiii). Cintron spends the first chapter examining this problems of ethnography and representation by recalling his own background as the son of a Texas farmer, defining the true field site as the text that is constructed by the ethnographer, analyzing the power of the researcher through the interplay of ethos and logos, etc. But what struck me most about the intro is its inductive approach. When Cintron narrates his data-collecting process — 300 pages of notes, 91 tapes, 100+ documents in one round and then a slew more in yet another round years later — and then we see how he arranges that data by navigating specific moments with Don Angel, Valerio, and others alongside his own interpretations, I get the sense of how messy and chaotic this project must have been. Although Cintron isn’t always explicit in connecting his dots, the reader certainly benefits from what must have been a rigorous revision process. Last week as we read and discussed an anthropology of writing (AOW), we heard perspectives about how an AOW studies so-called mundane sites like the workplace; this is different from ethnographers of the early and mid 20th century who studied othered, exotic sites and cultures. In chapter 2 of Angel Town, Cintron take up the question of romanticizing the subject: “For those who read and write ethnographies, the fieldsite is an ethnographic trope that generates both the spell of the exotic (romance) and resistance (science) to that spell” (16). Cintron tries to address this contradiction by studying a mundane map of Angeltown that “deflates the exotic and, in so doing, amplifies it” (16). As a researcher interested in studying a site that has shaped my own identity (self-publishing) I worry that I might fall prey to the romance Cintron evokes in this chapter. When we study material and subjects near and dear to us, then, how do we balance the romantic with the scientific? Does Cintron succeed in chapter 2 and throughout Angels Town? A CCC review of Angels Town called my attention to Cintron’s move to construct metaphors from his data. This made sense to me given the inductiveness of his project. But is his reading of data too figurative? That is, does he ever make too much of certain details (his reading of Valerio’s obsession of cars, for instance)? Is his rhetorical reading of certain instances of everyday life in Angeltown paradoxically too sweeping? Finally, given that Cintron’s fieldwork is now 20-25 years old, how might our privilege of distance help us assess the significance of this work in terms of cultural anthropology and writing studies? What do we need to take from this for our own work, and what needs to be left alone? Duncombe justifies his ethics by adopting the emic perspective of charitable participant-observer. And yet at the end of Notes he argues that as long as zines cling to a negative identity — an identity always at odds with but also attached to a dominant consumer culture — they will be politically ineffective. In fact, in a new afterward for the 2nd edition (2008) he accuses print zines of being little more than “an exercise in nostalgia,” characterizing zines as a bohemic ghetto (212). Of course Duncombe also lauds zines throughout Notes, but readers are left wondering how zinesters themselves — especially the thousands who still practice zine-ing — feel about this characterization of them. Perhaps an even more problematic example is Fanzines (2010) by Teal Triggs, who has been accused of printing zine covers without the permission of the authors or barely dialoging with her research subjects at all, a problem that led her to get several facts wrong in her book. While Triggs employs a purely historical/textual analysis in Fanzines, if the accusations are true, this is not only a legal issue for the zine community, but an ethical one that puts folks like me — potential researchers of zine communities — on notice. At the very least, perception is reality and zinesters have good reason to doubt the intentions of academics who are interested in speaking for them. Luckily, as Janice Radway has recently argued, many zinesters are also academics and librarians (like Jerianne at Underground Press) so they’re not completely divided communities. In any case, the ethics of ethnographers are taken up by several readings this week and I’d like to focus on two widely cited essays in particular from Ethics and Representation in Qualitative Studies of Literacy (1996): Tom Newkirk’s “Seduction and Betrayal in Qualitative Research” and Patricia Sullivan’s “Ethnography and the Problem of the ‘Other. '” Both advocate for a more critical understanding of ethnography, especially those that “study down” (e.g. examine the literate practices of those with less power), but represent slightly incompatible views of how to mitigate the ethical problems such qualitative work engenders. For Newkirk, the problem is informed consent: how to make research subjects aware that the information they provide could render them negatively — as racist teachers, bourgeois professionals, or unethical citizens. For Sullivan, a research project should “ultimately aim to benefit those whose voices, texts, and circumstances make [our] understanding possible” (98). For Newkirk, ethnography should allow for (and probably require) some bad news; Sullivan, on the other hand, is less comfortable with those conclusions, seeking to not just inform subjects of their representation, but to include them in actively constructing it. For Sullivan, self-reflexivity — “the explicit rendering of one’s own theoretical and political assumptions and beliefs as well as one’s experiences and emotions in the process of fieldwork — isn’t enough. Power-sharing discourse should be present throughout the research process where, “[p]articipants are involved in framing research questions, collecting and interpreting data, commenting on, and sometimes in, the final text” (109). This is perhaps where Sullivan and Newkirk are incompatible. While Newkirk argues for dialogue with participants within the process — especially with the consent agreement and “interpretation of problematical situations” during data gathering. Sullivan, though, would give participants more agency than this, involving them from the get-go when framing research questions and deciding which data is relevant data. I wonder, though, if Sullivan is painting too idealistic a picture of the research process. I wonder this partially because I can’t imagine wandering into a zine convention on onto an online zine community and asking them what questions should be asked. I’d receive empty looks or snide rebuttals. After all, if I don’t know what I’m looking for, then why am at that site. One study I’ve encountered through my bib that does emulate an ideal research practice is Katherine Schultz’s “Looking across Space and Time” from RTE in 2002. In that fairly influential study, Schultz uses multi-site ethnography to understand the literacy practices of high school students across contexts, in school and out. From her data analysis, Schultz find three themes from out-of-school writing: “(a) writing was largely a private practice they kept separate from their school lives, (b) writing was used to take a critical stance, c) writing was a bridge between their homes and school worlds” (368). One of the major and important conclusions to evolve from this last pattern is that once students graduated, they stopped writing out of school. Part of what I liked about this study was Schultz’s narration of how she triangulated data with her student participants even as she helped cart them back and forth from school to job in her car: “I showed the findings to the research participants to determine if the findings seemed valid from their perspectives” (367). And when she discusses the teachers in the study, she characterizes them as thoughtful and relevant. In fact, one implication of her findings is that school sponsorships of literacy have an indirect effects on self-sponsorships of literacy. Even though I think this is an ethical study, it makes me wonder what kinds of decisions she had to make throughout the process. Did she show her work to the teachers, who more or less have a back seat in the study? I wonder what other example studies in the field are useful for discussing Newkirk, Sullivan, and others this week. Thoughts? Anson, Chris. “Review Essay: A Field at Sixty-Something.” College Composition and Communication. 62.1 (2010): 216-228. Print. Smagorinsky, Peter. “The Method Section as Conceptual Epicenter in Constructing Social Science Research Reports.” Written Communication. 25.3 (2008): 389-411. 23 Jan. 2012. Young, Richard E. “Reading Research Papers.” Reading Empirical Research Studies: The Rhetoric of Research. Ed. Richard E. Young et al. Routledge, 1992. 11-40. Print. Charles Bazerman, editor New York: Lawrence Erlbaum, 2008. 652 pp. Charles A. MacArthur, Steve Graham, and Jill Fitzgerald, editors New York: Guilford, 2006. 468 pp. Susan Miller, editor New York: W.W. Norton, 2009. 1,760 pp. Peter Smagorinsky, editor New York: Teachers College Press, 2006. 308 pp. I know this sounds sophomoric, but I can’t help it: as I skimmed Anson’s review I was impressed at both the sheer amount of reading/refreshing he had to do to write such a short review and the disciplinary knowledge required to begin. commonly used empirical measures (central tendency, variability, and correlation). Because this chapter is rigid and loaded with relational terms (a rarity in a a theoretical program! ), I’d really like to sketch these ideas and terms visually with bubbl.us sometime this week and repost. Smagorinsky’s article, a wonderfully accessible essay which I had been hearing about for quite some time from J Lew, argues that greater care should be put toward the Method section of social science research (especially w/r/t the fields of literacy, education and comp/rhet). It should be essential to not only the product of the scholarship (in the sense that it would be publishable, replicable, or persuasive to its peers) but also its production (the process of its making). Smagorinsky, as former editor of RTE and and reviewer for nearly 30 different journals, finds a “lack of alignment” throughout most papers submitted to him to review. That is, the paper’s major sections — theory/literature, results, discussion — don’t add up. The Method section is the best place to start when it comes to research writing, argues Smagorinsky, because it is “the vehicle through which alignment” can be “systematically attempted” (405). “In particular,” he argues, “the outline of the analytic approach — for me, usually the articulation of a coding system — sets the terms for what I need to talk about means elsewhere in the manuscript” (406).